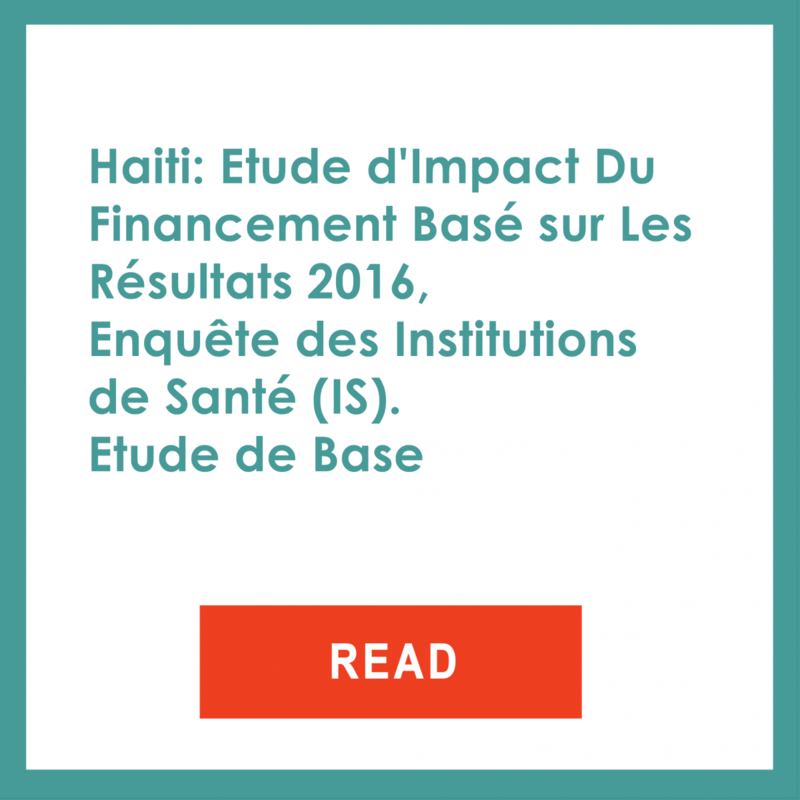 Previous experience with Results-Based Financing (RBF) mechanisms in Haiti—Result- Santé pour le Développement et la Stabilité d'Haïti (SDSH) program— implemented in several health facilities showed that these mechanisms may be a promising strategy for improving primary health care indicators. The evaluations conducted of the SDSH program showed substantial increase in rates of completely vaccinated children and prenatal care among women, as well as an increase in the quantities of primary health care services,. Based on these initial results with RBF, the Ministry of Public Health and Population (MSPP) made RBF mechanisms one of the key pillars of the 2012 National Health Strategy. 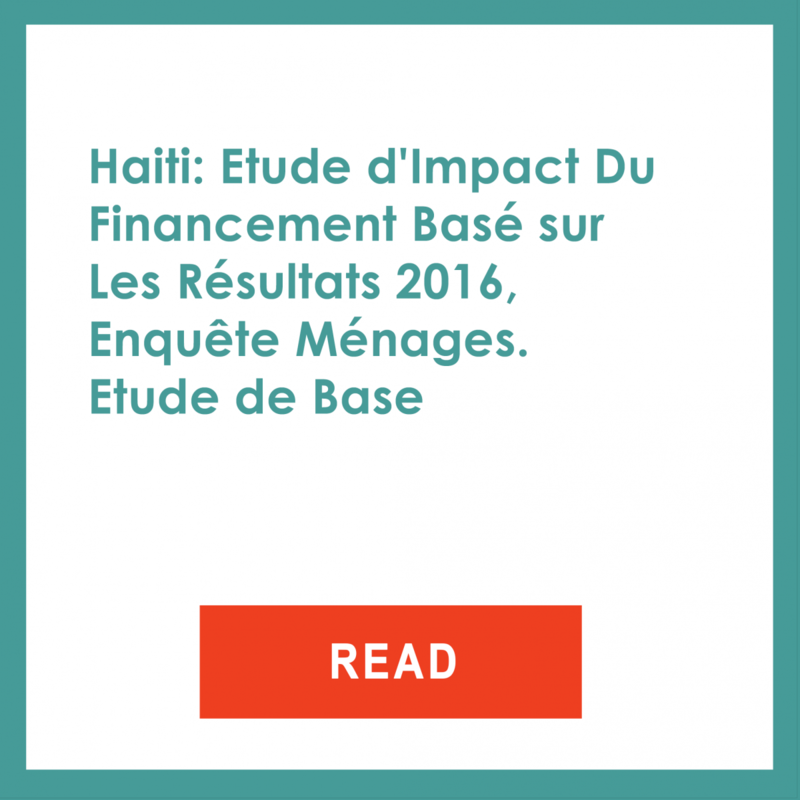 The new Haiti’s National RBF program has, however, few markedly different features from the original SDSH program. First, this new program pays health facilities directly rather than paying Non-Governmental Organizations to deliver results; in addition, the RBF funds received are based on a fee-for-service schedule rather than a target-based system used in the previous program. Further, the performance bonuses under this newer program make up a larger share of the overall payment to health facilities. Finally, an impact evaluation is included in the national RBF program to measure its impact. 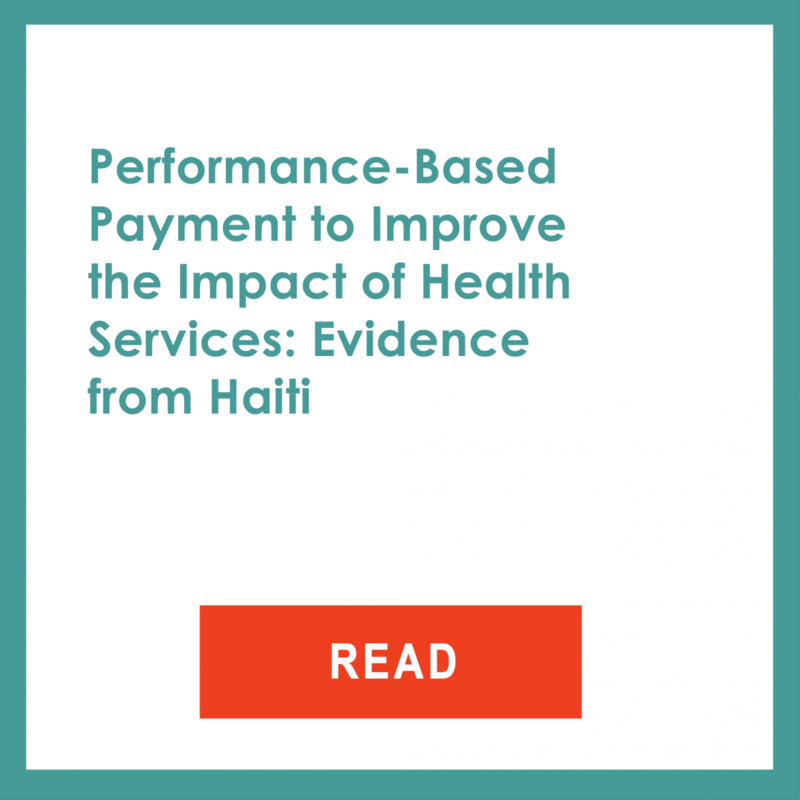 The primary objective of the evaluation is to measure the effect of the Haiti’s National RBF program on priority health outcomes, especially key maternal and child health indicators. The assessment will inform the MSPP and its partners on the viability of the strategy and whether the program should be scaled-up. To assess the impact of the program, the evaluation is based on a pre-post comparison and a randomized controlled experiment. There are two interventions and one control group; primary health care facilities surveyed are randomized to one of these three groups. This randomization process is intended to ensure that the three study groups are comparable in terms of observed and unobserved characteristics that could affect treatment outcomes so that the average differences in the outcomes can be causally attributed to the interventions. In the first intervention, health institutions implement a RBF mechanism and are provided with technical assistance or coaching. In the second intervention, the health facilities are only provided with coaching or technical assistance. 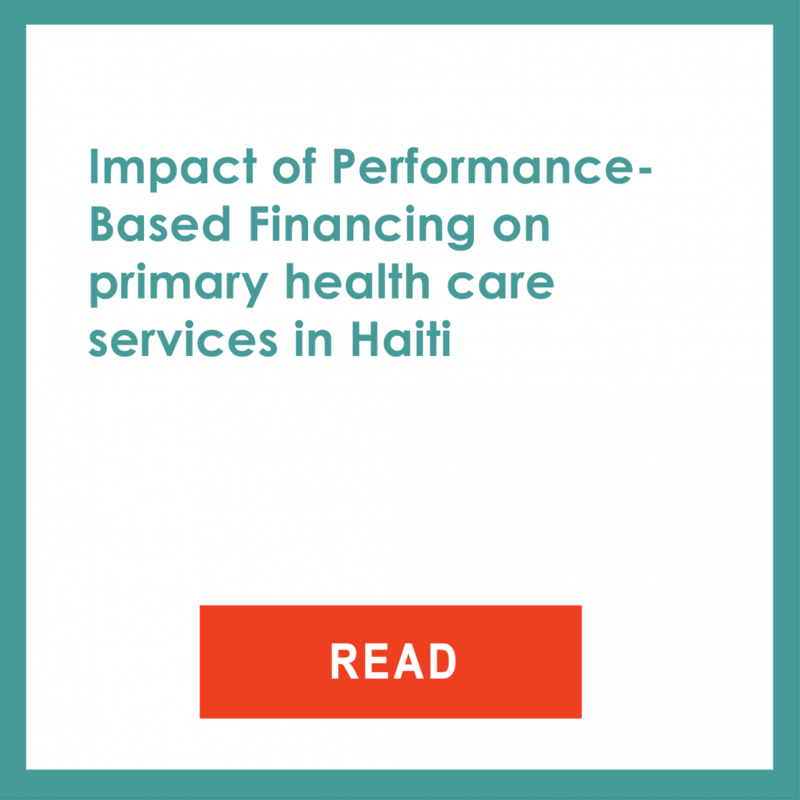 This intervention is tested after a study measuring the effect of performance-based funding implemented by Management Sciences for Health demonstrated the positive effect of technical assistance on the coverage of maternal and child health services. The sample for this study, however, was not representative and the health facilities were not randomized. Thus, the study had methodological weaknesses. The current evaluation design offers an opportunity to assess the effect of technical assistance or coaching and RBF on health services. The baseline data was collected and the report is under review. The endline survey is planned for 2018 and an impact analysis will be performed shortly after.